Some time in the mid-1990s, when the artist Louise Bourgeois was in her mid-80s, she asked her longtime assistant and friend, Jerry Gorovoy, to go to the top floor of her townhouse in Chelsea, New York City, and bring down some old fabric she had been storing in a closet. He returned with boxes of her old clothes – “by that point in her life, her own wardrobe had been reduced to pretty much a uniform of one or two black skirts and blouses, patent leather sneakers” – as well as those of her late mother and husband, and her children. Along with a few old napkins and tablecloths, she proceeded to transform the assorted material into series of collages, “fabric drawings” and sculptures. Bourgeois died aged 98 in 2010, and of course the work, made right up to her death, has survived her. A comprehensive survey – including examples of her fabric work – can be seen in an exhibition opening next week at the Scottish National Gallery of Modern Art in Edinburgh. But, intriguingly for an artist for whom the domestic space and personal possessions were so important, there are still boxes of fabric in her Chelsea home, and not just fabric. Entering Bourgeois’ house today is a remarkable experience that seems to capture half a century of a life making art. Along with the peeling paintwork and ancient, stained sink and hob are Bourgeois’ own hairbrushes, left the mantelpiece; there are still cans of food in the cupboards and cutlery in the drawers; among hundreds of used tubes of paint are also half-empty bottles of her nail varnish. When her eyesight started to deteriorate, she dispensed with an address book and began to write important phone numbers, in huge black numbers, on the walls. In her sitting room, a fax machine is submerged under tottering piles of yellowing paper and in the corner there is a thin tower – six or seven feet high and eerily reminiscent of some of her early sculptures – made from chocolate and cookie boxes given to her as presents and topped off with a precariously placed tube of Harrods biscuits, supporting a bottle of Glenmorangie scotch. “The way she lived, and how she thought, and the work she produced, was all seamless,” says Gorovoy. “Which is why we wanted to preserve the house as close as possible to how she left it.” Gorovoy now heads the foundation set up to administer her estate. Shortly before she died, it purchased the next-door property which will be converted into a research centre, with scholars and artists able to stay in her house and have access to her archive and diaries. The work and ideas she produced in this space are well-represented in the Edinburgh show. The exhibits draw on the Artist Rooms collection, established via the gift of former art dealer Anthony d’Offay’s own collection to the nation in 2008, as well as holdings from the Tate and Bourgeois’ foundation. 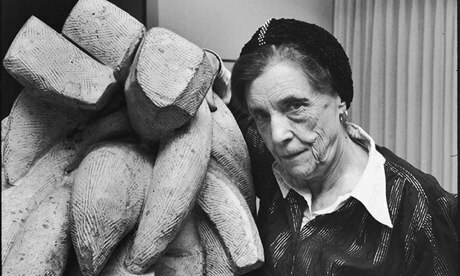 Louise Bourgeois: A Woman Without Secrets includes her famous spiders, and her “cells” of enclosed spaces housing psychologically and sexually charged objects as well as her drawings. Although there is much later work on display, as Bourgeois consistently explained, all her subjects can trace their inspiration back to a childhood that “never lost its magic, never lost its mystery and its drama”. Bourgeois was born on Christmas Day 1911 and brought up just outside Paris, where, as a girl, she helped in her mother’s tapestry restoration business. The key psychological event was the discovery that her father was having an affair with her English tutor, Sadie, which she saw as a betrayal by both of them, and the way he tormented and embarrassed her remained a constant source of both pain and inspiration. When the affair was revealed, Louise attempted suicide, and shortly after she nursed her increasingly frail mother until her death, when Louise was only 21, in 1932. Although Bourgeois had studied maths and enrolled in the Sorbonne to read geometry, she soon abandoned science for art and became part of the pre-war avant garde scene in the city where she was taught by, among others, Fernand Léger. She opened a small gallery in Paris and, in 1938, she both met and married Goldwater. They moved to New York before the outbreak of war and adopted one son, and then had two more of their own. The couple moved in the city’s art and expat worlds and were friends with Le Corbusier and Miró as well as coming into contact with Duchamp and André Breton. As Anthony d’Offay says, Bourgeois’ journey from tapestry to the cutting edge of modern art put her in an almost unique position as a “link between the arts and culture of the medieval world and the Renaissance and the modern world of cubism, surrealism, psychoanalysis and the postwar, post-Freudian openness about sexuality”. Throughout the postwar decades, Bourgeois made art and had solo and group shows. In her early paintings, the Femme Maison series, she depicted figures that were half woman, half house. Next came her “personages”, delicately balanced, elongated semi-abstract, semi-figurative sculptures representing the people she had known in France and America. By the 60s she was working with bronze and marble, but also less conventionally with rubber, to produce confrontationally imaginative depictions of male and female genitalia. Although she began to gain a reputation within the burgeoning feminist movement, and was collected by institutions as prestigious as Museum of Modern Art and the Whitney, it wasn’t until the 1980s that she attained any sort of profile outside the art world; she didn’t really enter the wider public consciousness until 1993, when she represented the US at the Venice Biennale. In later years she became agoraphobic, to add to her lifelong bouts of insomnia, and rarely left her home. “But she wasn’t a hermit,” explains Gorovoy. “She had commissions. She did interviews. But people had to come to her.” She hosted a Sunday afternoon salon where artists would come and talk about their work – she never showed her own work – and where Gorovoy’s role was to serve her guests drinks so that they would open up while she stayed sober. Artist Rooms Louise Bourgeois: A Woman Without Secrets is at the Scottish National Gallery of Modern Art from 26 October to 18 May 2014.